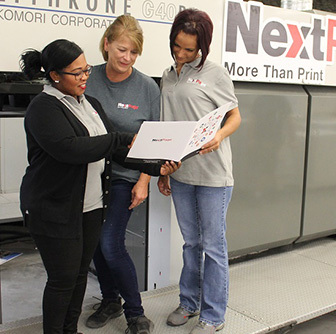 NextPage combines traditional print expertise with dynamic personalized digital marketing technologies to drive results. NextPage turned to PayServ Systems to help streamline their HR/Payroll needs by providing an HCM Solution that they could grow into. "We had no HR Software in place and had to do a lot of data entry into our Payroll system," said Tracey Burton, HR. "Next Page needed the ability for ad hoc reporting along with an HR/Payroll system to grow with them." Robust reporting capabilities. A complete Payroll and HR solution. And Affordable Care Act support. New Hire Orientation takes much less time than before. For instance, Tracey is able to setup new hires a week or so in advance. This allows new hires to come in the first day with little to no paperwork to fill out because it is all completed online. Tracey can now focus on important onboarding items like policies and culture. She also loves to use "My Learning" and encourages employees to use it as well. Tracey was impressed by PayServ's smooth implementation process. Weekly calls provided updates and a time for questions. "The PayServ team was fantastic," she said. Tracey communicates mostly via email for support, and is confident her personal support representative Courtnee can handle items as they come up.